Oil prices and a Fed-related wobble shaped USD/CAD trading. A busy week including the BOC decision and the jobs report awaits. The technical picture remains bullish for the pair but experts see a downfall in the medium and long terms. Prices of oil continued affecting the Canadian Dollar quite adversely. Reports that Russia is in no rush to cut production weighed on oil prices. WTI Crude Oil fell below $50. A change of heart in Moscow helped the black gold recover, but prices remain low. Oil output will surely be discussed at the G-20 Summit over the weekend where the world's largest producers meet: the US, Saudi Arabia, and Russia will all attend the gathering. Canadian GDP came out at 2% annualized in Q3, as expected. The disappointment was the monthly figure for September which dropped by 0.1% against an increase of 0.1% projected. US President Donald Trump and his Administration are reportedly mulling tariffs on cars before Christmas. Canada and Mexico may be spared from these duties but the talk did not help sentiment and the C$ also suffered. Trade talks are also on the agenda in the gathering of world leaders in Buenos Aires. Trump complained about the Fed's rate hikes and Fed Chair Jerome Powell went slightly dovish in his speech. The event may or may not be related, but after Powell said that rates are "just below" the neutral rate, stocks soared and the greenback slumped. A rethink of his speech resulted in a more nuanced perception and reaction. US data was mixed, with a confirmation of GDP growth at 3.5% annualized in Q3 but with a weaker composition. Housing data mostly missed and jobless claims continued rising. Markit's forward-looking index for the manufacturing sector kicks off the week. It stood at 53.9 in October, reflecting OK growth levels. The scene heats up on Wednesday with the rate decision by the Bank of Canada. The Ottawa-based institution is projected to leave the interest rate unchanged at 1.75%. The last meeting of the year does not consist of a press conference nor new forecasts. However, Governor Stephen Poloz and his colleagues will likely maintain the hawkish bias, signaling a rate hike in January. The economy is doing well and the new trade deal provides a dose of certainty to Canadian businesses. 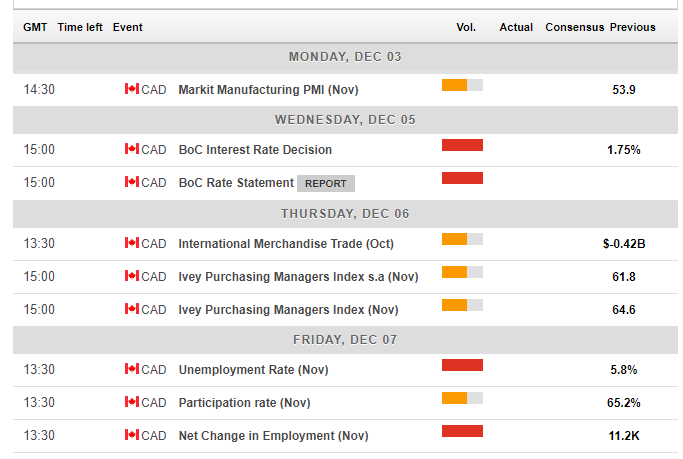 Thursday sees the Ivey PMI for November. The gauge fell sharply in September amid a lack of progress in trade talks and rebounded back above 60 points. Friday features the all-important jobs report for November, published in tandem with the US Non-Farm Payrolls. Back in October, Canada saw a moderate increase of 11.2K jobs after months of high volatility. The Unemployment Rate dropped to 5.8%. Apart from these figures, the mix of part-time and full-time jobs is of high importance, and so is wage growth, which fell from high levels early in the year. The week commences with a reaction to the summit between Trump and Xi over the weekend. The US Dollar is set to rise if talks end with an acrimonious tone and slide if there is any sort of agreement. Monday features the first hint towards Friday's Non-Farm Payrolls. The ISM Manufacturing PMI slid in October but remained on high levels. 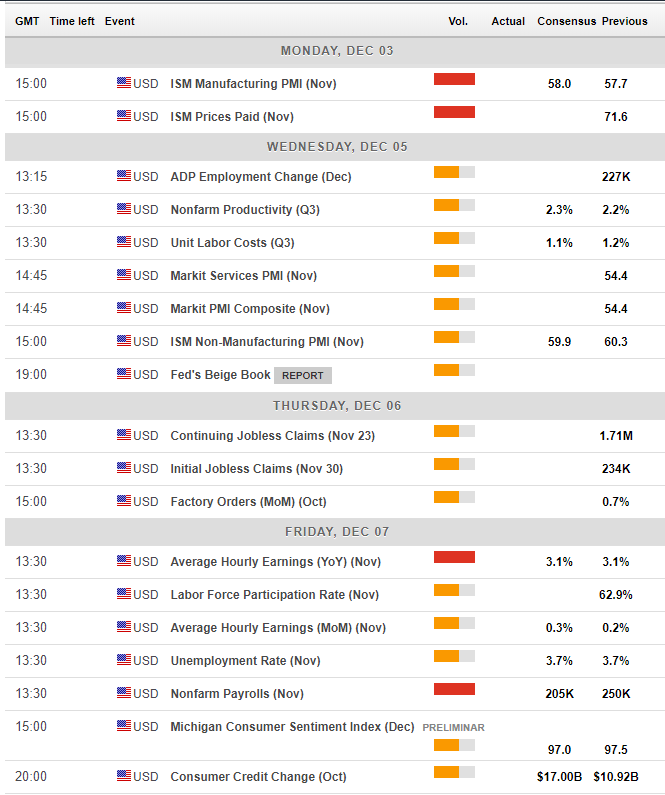 The ADP NFP on Wednesday serves as another substantial leading indicator. October saw a significant increase in positions: 227K. In this case, the data were correlated. This is not always the case. The ISM Non-Manufacturing PMI and its employment component provide the final hint towards the NFP. Jobs Friday is expected to be upbeat, yet not as great as the previous one. After a robust gain of 250K jobs in October, a more moderate rise is on the cards. Wage growth is expected to advance at a faster pace month over month: 0.3% against 0.2% previously. Year over year, the break above 3% is projected to be maintained for a second consecutive month. Trump's legal issues are also noteworthy. His former lawyer and "fixer" Michael Cohen is now collaborating with the Mueller investigation and the President is in the limelight. In the past, the greenback suffered alongisde the resident of the White House. 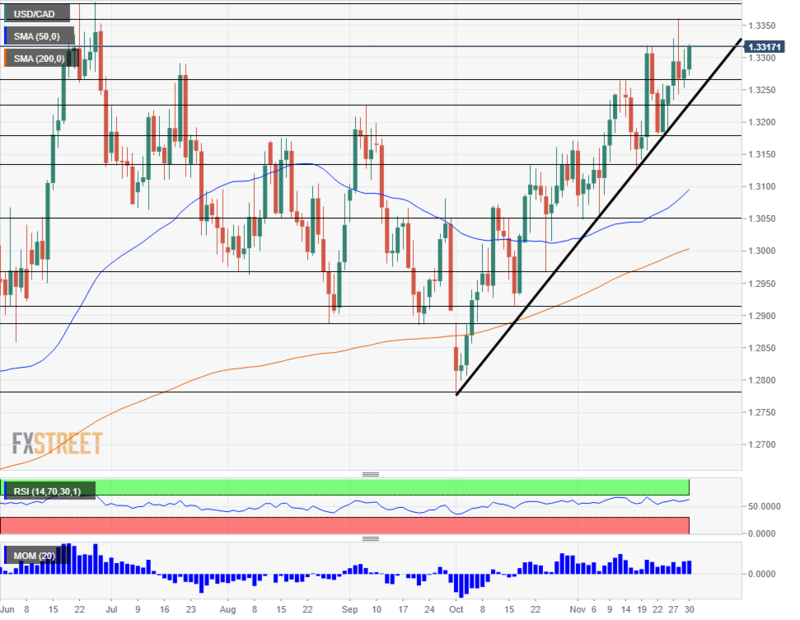 USD/CAD continues trading alongside an uptrend support line that accompanied its movements since October 1st. Moreover, Momentum remains to the upside and the Relative Strength Index remains below 70, showing that the pair does not suffer from overbought conditions. Dollar/CAD also trades above the 50-day and 200-day Simple Moving Averages. The bulls seem to be in full control. The recent peak of 1.3360 serves as a line of resistance. It is followed by 1.3380, the peak of 2018 so far. The next levels date back to the first half of 2017. 1.3430 capped provided support in June 2017. Further above, 1.3540 was a stubborn cap earlier in the year. 1.3645 follows. 1.3260 capped the pair in mid-November. 1.3225 was a swing high at the end of the summer. 1.3175 provided support in mid-November and 1.3125 was another trough in that month. The next line of support is only at 1.3050 which was a low point in early November. It is followed by 1.2970. The worsening global environment may push oil prices and stocks lower and this does not bode well for the Canadian Dollar. Moreover, despite the bumps in the US economy, the Fed is on course to raise rates and this supports the greenback. 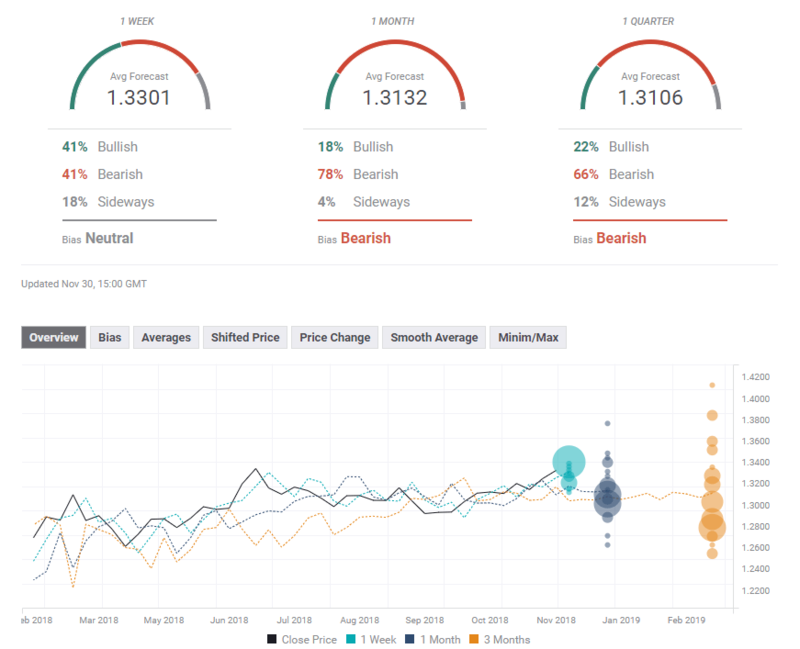 The FXStreet forex poll of experts shows a neutral trend in the short term but a bearish one in the medium and long terms. The average forecast has been upgraded for the short term but remained stable afterward.